An earthquake that rattled houses in a village northwest of Edmonton Monday was no ordinary tremor, says a glaciologist with expertise in ice quakes. The cause of the 2.0 magnitude temblor that hit Alberta Beach is mysterious, said Jeff Kavanaugh, a professor of earth and atmospheric sciences at the University of Alberta. Ice quakes occur when cold winter temperatures quickly freeze groundwater, causing the ground to crack. But Kavanaugh doesn't think what happened in Alberta Beach was an ordinary ice quake, in part because temperatures were on the rise in the hours before the tremors began. "That's not what happened here," Kavanaugh said in an interview with CBC Radio's Edmonton AM. "What happened here is the ground warmed up by 30 degrees over the 24 hours preceding these ice quakes and then fractured. "The mystery there is why would it warm, expand, and then crack? That's the mystery." Some residents of Alberta Beach, located on the shores of Lac Ste. Anne about 40 kilometres northwest of Edmonton, awoke Monday to a loud bang, and in the morning they reported cracks in homes and the ground. The Alberta Energy Regulator's Alberta Geological Survey confirms there were two seismic events of approximately 2.0 magnitude late Monday. Alberta Energy Regulator spokesman Jordan Fitzgerald said staff can't confirm their exact location due to the low magnitude and the sparsity of nearby seismic stations, but initial information shows they were consistent with reports of an earthquake near Alberta Beach. Ice quakes — or cryoseisms — are normally caused by a sudden drop in temperatures, said Kavanaugh. A cold snap will cause water in the ground to freeze and expand. The ice has nowhere to go so as pressure mounts, it eventually cracks the soil, causing the earth to shake. The Alberta Beach quake may have been a reverse version of the phenomena, said Kavanaugh. "The twist to this story was this was a warming [period], not a cooling period." 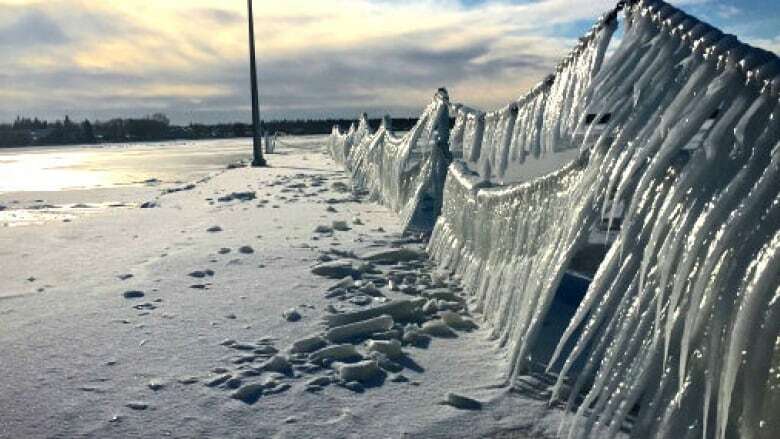 ​The temperature in Alberta Beach changed dramatically over a few days. On Monday, Alberta Beach went from a low of –28 C to a high of –6. "If you had a cubic metre of ice in the ground, that would contract about the width of a human hair," Kavanaugh said. "It's a very small contraction, but with that contraction comes enormous forces and that can be enough to rupture the ground." Kavanaugh hypothesizes that a series of unusual factors might account for the strange circumstances of Monday's quake — heavy lake ice, the clash of temperatures between the ground underneath the lake and the ground of the shoreline, and strong winds. The winds may have heaved the thick lake ice up onto the shore, creating enormous pressure, said Kavanaugh. "The wind speeds were calm and then peaked at the period of cracking around midnight," he said. "So they might have played a part, because with lake ice out there, the wind would try to force that ice around. "My guess is that it was kind of a perfect storm of three things." Jim Benedict, mayor of Alberta Beach, said the water table in the area is high and says it's possible it froze and "popped." Benedict said people thought something had hit their houses — or that something had fallen on their houses — very early Tuesday morning. "I slept through it. I had people phoning me saying they'd heard it at 1:30 and they thought there was an explosion somewhere," Benedict said. Benedict said the reports of possible damage were at homes close to the shore of Lac Ste. Anne. He said on Tuesday, he noticed the ice on the lake had heaved and open water appeared. He said popping noises were coming from the lake all day.